Parkway's Ean Morton, Mike Robertson and Tristan Morton celebrate their British Isles triples success at Leamington. Local bowlers Mike Robertson and brothers Ean and Tristan Morton have been crowned British Isles triples champions. 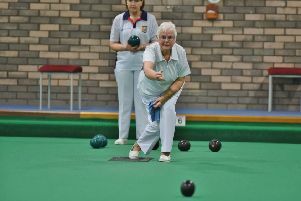 They converted last year’s English national triples championship into a British success at the same Leamington venue. The Parkway trio were comprehensive 21-7 winners in the final against Jersey’s Graham Thomas, Mike Videgrain and Tommy Greechan, which included a five count on the 12th end which put the match beyond any doubt. 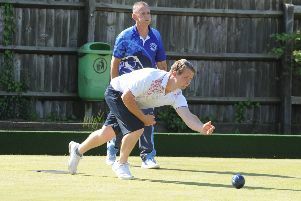 In the semi-finals, they defeated another challenger from the Channel Islands in Guernsey’s Garry and Nigel Collins and Matt Le Ber, the final score being 20-15, but the Parkway boys did lead 18-7 at one stage before a nail-biting conclusion that saw their advantage whittled down to three before settling the issue with singles on the last two ends.